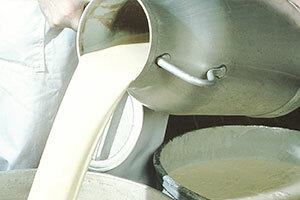 Our cooperative, situated in an exceptional terroir, benefits from top quality milk. Our producer members also work on the feeding of the cows, to ensure that they maintain the best nutritional qualities of their milk. Every ingredient used (such as vegetable oils, demineralised whey, minerals and other nutrients) meets the standards set out in a strictly-drafted technical manual, which guarantees its origins and compliance. We regularly audit our suppliers to ensure the consistent and high quality of our products. Ingredients are checked on arrival by our own onsite laboratory, which uses standardised methods, eg AFNOR. We carry out more than 250 quality checks on every batch we manufacture, from the arrival of ingredients up to the packing of finished product. Batches are released after three weeks of testing. 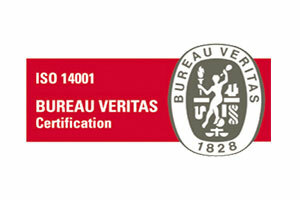 Isigny Sainte-Mère was the first French food industry business to be certified under ISO 9001 by the accreditation organisation BVQI in 1990. In 2009, the cooperative’s accreditation under ISO 14001 underpinned its environmental Policy and in 2017, the cooperative’s accreditation under ISO 50001. In January 2000, Isigny Sainte-Mère was certified under the Agri-Confiance scheme. This new quality policy strengthened traceability upstream of the production site, through the certification of its members’ agricultural holdings. 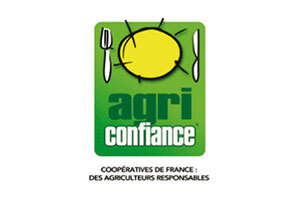 This new certification complements the ISO 9001 standard, allowing Isigny Sainte-Mère to ensure full traceability and product security “from the field to the fork.” The Agri-Confiance certification takes into account the feeding of the herd on a holding, hygiene on the farm, animal welfare, the environment and milk collection procédures. 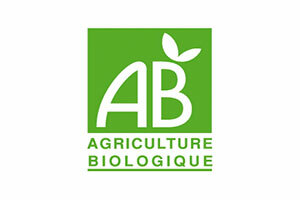 Isigny Sainte-Mère was certified HACCP-compliant under IFS standards in August 2006. The Isigny Sainte-Mère cooperative obtained organic certification under Qualité France in 1997. The full traceability of our products is guarranteed. 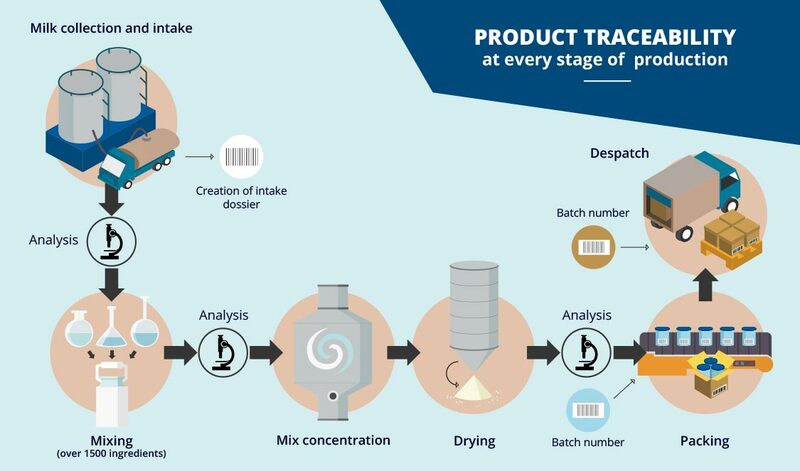 From a batch number on the packaging, the product can be traced back through all its stages: from the arrival of milk at the production site, right through to the packing of the finished product. We work in compliance with European legislation, as set out in the 2006 directive, as well as the regulations in force in the countries where our products are sold. These different legislative frameworks allow us to be in step with evolving manufacturing practices concerning the feeding of sensitive segments of the population such as unweaned babies, pregnant women and senior citizens. We permanently monitor legislation concerning ingredients (both in their original form and any subsequent changes). We also monitor scientific advances concerning the feeding of sensitive segments of the population such as unweaned babies, pregnant women and senior citizens. Our laboratory enables us to validate a new formulation on the basis of industrial pre-production pilot batches. 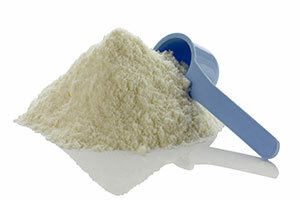 Our onsite laboratory analyses all the ingredients and the finished product as if it was ready for market. This method ensures that our production conforms to the client’s technical manual and complies with the national legislation as it applies in the country where the baby milk will be sold. 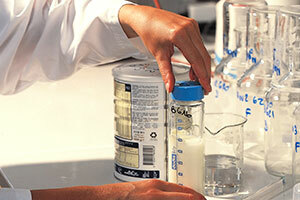 More than 250 quality tests on every manufactured batch (milk intake, ingredients, packaging, packed, finished product). A certified management framework from the farm to the packed, finished product. 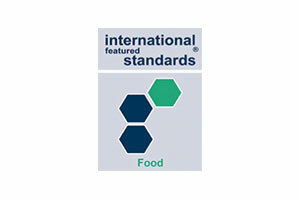 This framework is made up of: Agri Confiance®, HACCP, ISO 9001 et 14001, IFS, BRC, BIO and AOP.